Golden Retrievers are a very popular kind of dog. When the breed was first created, they were used for hunting. Now, they are sometimes used for hunting, but a lot of people like to have them as pets because they are very friendly. People also like them because their face looks like they are smiling all the time. Because they are so friendly, Golden Retrievers cannot be used as guard dogs, but they are good as drug dogs at airports and very good as service dogs for the blind (People who cannot see). They also like people, so when they are left alone for too long, they get very sad. Golden retrievers make very good pets because they are friendly and playful. Golden Retrievers are very good family dogs because they are extremely sweet and gentle with young children and do not bark very much. They are known for having a "soft mouth," and some have even been seen carrying raw eggs in their mouth without breaking them.[source?] Goldens are well known for their calm and easy going temperament. They are great family dogs and provide good companionship. They are very smart and eager to please, which allows them to be easily trained. Golden Retrievers are very active dogs and need a lot of exercise. Goldens make wonderful pets, but they need to be exercised regularly to prevent weight gain and promote overall health. They require a great deal of grooming, as they shed hair daily. Goldens also enjoy the cool water. A good Golden Retriever has a strong body and a long coat that is yellow or gold. Their fur even stops water because it has two special layers, one short and one long. They always have brown eyes and can show a lot of emotions with them. When they get old, their face turns white, but when they are young, they should not have any white on them. A normal male dog weighs about 29 to 36 kilograms(65 to 80 pounds) and a normal female dog weighs about 27 to 32 kilograms (60 to 70 pounds). From their front paws to their upper back, they are about 56 to 61 centimetres (22 to 25 inches) tall. As said earlier, Goldens are used a lot for people who cannot see, but they are also used for obedience trials and as assistant dogs for people who have seizures or cannot hear. They are very good at smelling things, so they are also good for hunting. The second part of their name, retriever, is very true because they love to fetch things for their people! Goldens love to catch tennis balls and frisbees. Goldens also enjoy the water. There are two different kinds of Golden Retrievers: show dogs and field dogs. Show dogs have very long hair and a lighter color, but field dogs have a lot more differences. They have short hair and can have any shade of hair. Because they have shorter hair, it is easier to brush them because they do not get as many things caught in it. Like a lot of purebred dogs, Goldens can have bad health. A big problem for Goldens is hip dysplasia, which makes the dog's bones hurt at its hips. Also, a lot of Goldens have skin allergies, so people have to be very careful to not wash the dog too much and make sure that it does not get fleas. It is also important to clean a Goldens ears regularly because their long ears do not give the ear canal a chance to breathe. Goldens also have problems with their eyes sometimes, but it's mostly when they get older.It is important when purchasing a new Golden Retriever puppy to review the medical history of their parents. Oftentimes "backyard breeders" have been known to over breed or breed dogs with health problems. A reputable breeder should be able to supply the most current heatlth records for the dogs which they are breeding. Golden Retrievers were developed by Lord Tweedmouth in Scotland. He took a yellow dog and another dog called a Tweed Water Spaniel, which is a dog that does not exist anymore. All Golden Retrievers are related to these two dogs. The breed was created to be stronger than other retrievers but more gentle with people so they could be trained very easily. In 1903, the breed was added to the list of the Kennel Club of England, but it was not added to the list of the American Kennel Club until 1932. 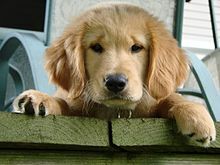 Now, there are millions of Goldens around the world and they remain as one of the most popular breeds. Golden Retriever called 'Liberty' belonged to United States President Gerald R. Ford. This breed was in many films and TV series, including: Air Bud and Air Bud: Golden Receiver, Full House, Homeward Bound: The Incredible Journey and Homeward Bound II: Lost in San Francisco,Fluke, Napoleon, Up, Pushing Daisies, and The Drew Carey Show. A dog called Cash from The Fox and the Hound 2 was a mix of Golden Retriever and other breed. Wikimedia Commons has media related to Golden Retriever. This page was last changed on 30 January 2019, at 04:35.